Meshify exhibits powerful performance with bold aesthetics magnified to an all new degree in the larger and even more capable Meshify S2. In a unique instance of refinement eliminating constraint, the Meshify S2’s modular open layout is all but an end to hardware restrictions. Meshify S2 boasts immense cooling capacity with three Dynamic X2 fans, nine total fan positions, 420/360/280mm radiator mounts, built-in pump and reservoir support, and an innovative removable top bracket. 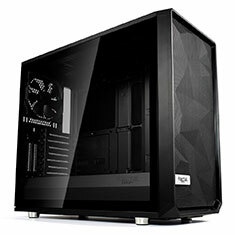 Other new additions include USB Type-C, a versatile PSU shroud, Flex-VRC Vertical GPU Riser support, and bolt-free tempered glass. The largest Meshify case to date combines all the strengths of its predecessors with Fractal Design’s most revolutionary modular design elements. Its iconic angular mesh offers more than just a distinctive look—it augments air intake and unleashes the true potential of the open-layout PC. Unrivalled performance demands to be seen in the Meshify S2.